Denise Pecora has lived an incredibly varied and diverse life, beginning with her childhood in rural South Carolina. “It was a very simple country life, we really didn’t have much,” said Denise. Childhood activities included swimming in the river, learning to shoot a rifle when she was eight years old, and Sunday service at the local Baptist church. Then her world turned upside down when her parents moved their family to the south side of Chicago. “I went from being a Southern Baptist to attending Catholic school and riding the L train,” said Denise. Her dad worked for the city of Chicago, and also had a real estate business with his brothers; her mom became a local politician. From a very early age Denise became fascinated with the military. Her dream was to be a “frogman” after watching the Astronauts being lifted into the helicopter at the time of the early NASA missions. After attending Northern Illinois University, Denise enlisted in the United States Navy as a Corpsman, also attached to the Marine Corps. She became a National Registered paramedic in her military training and helicopter medic. Her duty was primarily on the East Coast from Portsmouth Naval Hospital in Virginia, Little Creek Naval Base in Norfolk Virginia with the Navy Seals, and Camp LeJeune Marine Corps Base in North Carolina. Denise was also selected to play on the All-Navy Volleyball team. Denise later served as a medic at the Navy Yard in Washington, D.C., and was attached to the Presidential Drill Team at the historic 8th and I Marine Base, the oldest Marine Base in the US, founded by Thomas Jefferson. She served as a National Registered Paramedic in Northern Virginia and Washington, D.C. It was during this time in 1991 that she met her future partner Kit Ryan while playing on a co-ed softball team, and around that time they bought a condo in Henlopen Station in Rehoboth as a “beach getaway.” In 1996, they were joined together in a holy union, and have been together for 26 years. They were legally married the same date in 2013. After seven years of active duty and some reserve duty, Denise was honorably discharged from the Navy. A financial planner with Principal Financial Group, Kit was transferred to the Philadelphia, Pennsylvania area, and they moved to Broomall, in Marple Township, Delaware County. Denise was very concerned about women’s health issues because, as she puts it, “women’s health was really an underserved issue. Nearly all research and studies on cardiac diseases were performed on men. The medical profession really had very little knowledge about how heart disease and conditions affected women.” So Denise decided to empower herself and she enrolled in a brand-new accelerated Bachelor’s/Master’s Nurse Practitioner program at Widener University in Chester, Pennsylvania. She became the first graduate of that program. In addition to going to college full-time, she also worked as an RN at Riddle Memorial Hospital in Media, PA, and volunteered as a paramedic for Lima Fire Company. In 2001, she graduated from Widener, and worked as a cardiac Nurse Practitioner for a private practice at Lankenau Hospital in Bryn Mawr, PA, then from 2004 to 2007 in the ICU at Chester County Hospital in West Chester, Pennsylvania. Meanwhile, in 2005 Kit also empowered herself by leaving her corporate career and starting her own financial services firm, KMR Financial Network. Their path to the beach began one night in 2007 when Kit and Denise were having sushi at the Cultured Pearl. Seated next to them was Katie Halen, Vice President of Human Relations at Beebe Hospital. 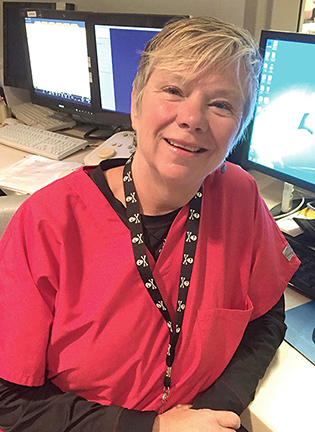 During the ensuing small talk when Katie discovered Denise’s profession, she said to Denise, “We need you now.” Beebe had just begun an Interventional Cardiology Program, and within a few months Denise was hired at Beebe, and Kit and Denise began their beach life. Having worked at large city hospitals, as well as community hospitals, Denise, when asked to compare the two, said, “In a big city hospital, I am a small fish in a big sea. At a community hospital, such as Beebe, I have the chance to really make a difference in the local community’s health care and save lives.” Beebe is now among the top 100 hospitals in the country for Interventional Cardiology. Beebe and Christiana Hospital are the only hospitals in Delaware to have the Impella device, which is a heart pump designed to provide emergency support during a heart attack until the patient can get into surgery. “We have saved many lives after a heart attack due to the hard work and dedication put forth by our Interventional Cardiology team,” said Denise. Denise has volunteered her time to teach Basic and Advanced Life Support at both Beebe and at CAMP Rehoboth. In additions, she has lectured on women’s health issues at CAMP Rehoboth during Women’s FEST. She is happy to answer health care questions. Denise can be reached at her cardiac practice at 302-645-3646.